Some good news for all of you who enjoy fishing (and a lot of our guests do): a new trout fishing program opened October 1, in Old Fort, NC, at Mountain Gateway Museum (about 15 minutes east of the Inn on Mill Creek). The museum grounds are now a public access point for trout fishermen during the delayed harvest season. In addition to the new access site, the museum is participating in the North Carolina Wildlife Commission’s new Tackle Loaner Program. Program details are online at the NC Wildlife Commission website along with a PDF map of the site. 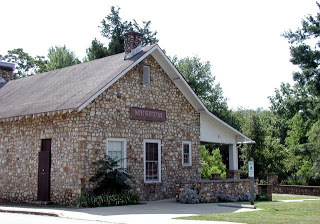 Mountain Gateway Museum and Heritage Center at 102 Water Street in Old Fort is free to the general public and is already known as a museum that successfully promotes and preserves the history and heritage of this part of western North Carolina. Now, visitors may take a break, borrow some equipment and spend quiet time fishing on the scenic banks of Mill Creek, a popular activity for residents and visitors alike. A 1.7-mile portion of Curtis Creek, classified as delayed-harvest, is located on Commission game lands just off U.S. 70 east of Old Fort and is equipped with two universally accessible piers.